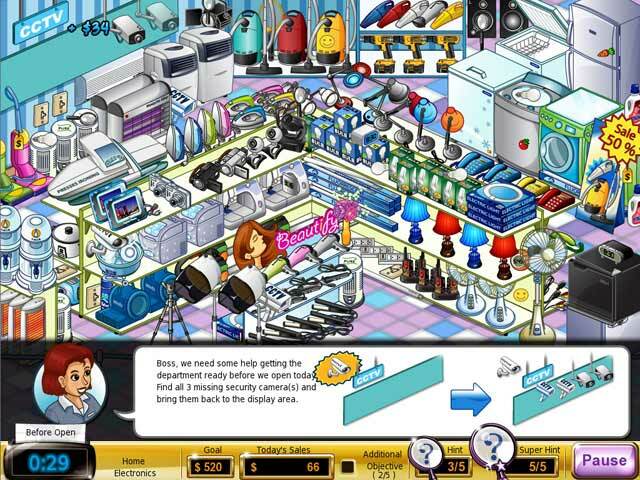 Shop-n-Spree is a unique blend of Hidden Object and Time Management gameplay. When a shopping super-center lumbers into town, it`s up to you to save the ailing family business! Keep your customers satisfied with great service and exciting upgrades or they just might take their business elsewhere. 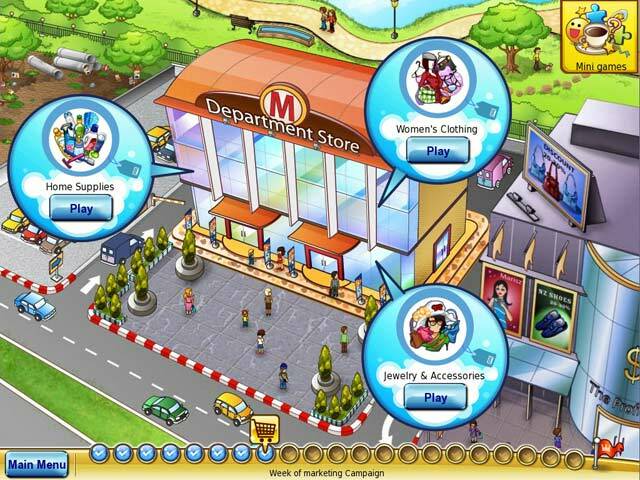 Endless aisles of supermarket seek and find fun with a variety of mini-games await you! Grab Shop-n-Spree today and get down to business! 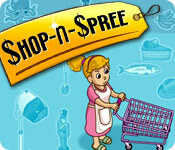 Shop-n-Spree is rated 4.1 out of 5 by 12. Rated 5 out of 5 by iamAijhay from excellent totally great. its fun to use. Rated 5 out of 5 by michelle1187 from Super Fun HO Game This game is really fun! I love that it's just a fun and simple hidden object game with cute graphics and fun mini games. Playing through all the different departments was great! For those looking to simply play a hidden object game then you might enjoy this one. Rated 5 out of 5 by TheOldWife from Lots of HO and TM fun Lots of fun in this combination hidden object/time management shopping-themed game. I played this one and the second in the series. Both are fun. Hope there are more coming. Rated 5 out of 5 by Pucktweety from So simple & cute! I think this game is just SO adorable! I absolutely love playing it for the graphics alone. The whole 'personal shopper' thing is something I really enjoyed throughout and it never lost it's fun! There is also a lot of smaller challenges and mini-games to keep you interested and to stop it being repetitive. The one thing I would change about this game, which I was hoping would be implemented into the second one but wasn't is the ability to click and the item be delivered instead of having to drag it to the person that requested it! Rated 5 out of 5 by adolia from Light hidden object game This is a great hidden object game for beginners. In many instances there are more than one object that will meet the criteria, and you have several customers at a time so if you can't find an object you can move on to something else. Customers leave if you take too long and are replaced with new customers. Rated 5 out of 5 by MyMay from This game is super exciting You get to run a store with customers, find stuff for people, you get hints. It's just super fun! Rated 5 out of 5 by dthomas0512 from Exciting Games The games are exciting and fun. 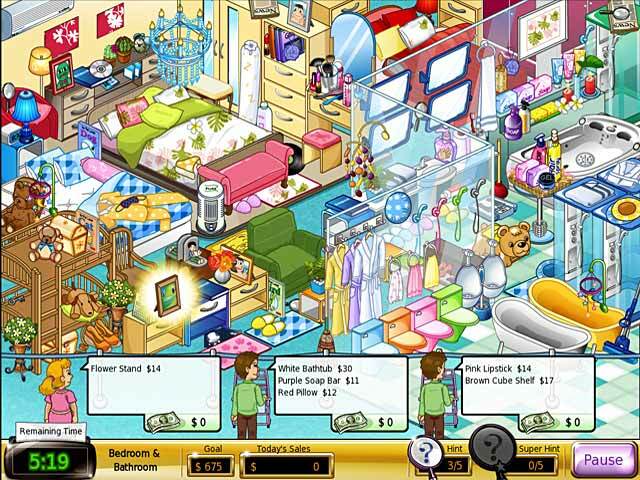 Rated 4 out of 5 by Debi_W from Shop n Spree is a game you can play several ways This was one of my first TM games that I enjoyed after getting past how boring it was to begin with. I've played and replayed this game for quite some time now. My biggest challenge is for me to beat my time and score each time I do replay. While there are a lot of duplicate shops the goal for each is slightly different. The mini games can on occasion, be challenging as well. It is a game that from start to finish is going to take a while. I find it relaxing now as opposed to frustrating like I did the first time or two I played it. Keynote here is: After a couple of years of playing, this game can and does hold my interest. Rated 4 out of 5 by batikati from Simple but fun at the same time! This looks like a simple little game, but when you get into it you discover that there are a LOT of objects to sort through, to find what you need. But with practice, it gets easier, and you will enjoy yourself. If you take too long finding what the customers need, they will vanish and cost you a few points. That is no big deal to me, but others may find themselves rushed sometimes. I did enjoy playing it, and also thought the mini games were fun! You can earn extra hints with different things, and that really helps! Give it a try, and I don't think you will be disappointed. Rated 4 out of 5 by Heather_22 from Not bad for wasting time It is a good game to pass the time i found it to be a time management game with a bit of hidden object thrown in. It does get a bit repetitive though after awhile. The graphics are ok and the sound is ok.
Save the family store in this unique mix of Time Management and Hidden Object gameplay!